Mum of two Kathryn Tooth ran the Virgin London Marathon in in memory of her parents who both died of bowel cancer. Kathryn decided to pick up her running shoes and take on a true mental and physical challenge and help Beating Bowel Cancer in the process. 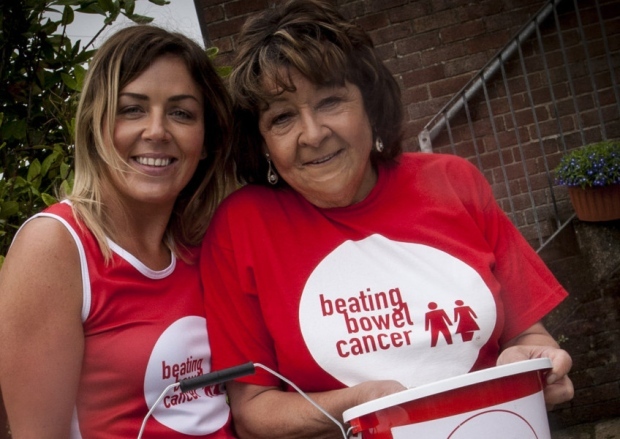 Kathryn’s mother, Julie Thompson, was diagnosed with bowel cancer in 1997 and died eight months later when she was only 54-years-old. Then in 2010, her father Mike Thompson became ill and lost weight rapidly. Tests revealed he had bowel cancer, but after surgery and chemotherapy, he beat the disease in time to celebrate his 70th birthday. Sadly the cancer returned and he lost his battle in September 2012. Kathryn says, “I wanted to do something positive in Mum and Dad’s memory as they were the kind of people who always believed in going out and grabbing every opportunity. I’d been to cheer on London marathon runners in previous years and had been inspired. But I’d only run a couple of 5k races before, so the distance of the marathon was daunting. “Beating Bowel Cancer was obviously a cause close to my heart and the team were incredibly supportive of me whilst I was training. I received a fundraising pack as well as training tips and they’d regularly get in touch. On the day it was great to see the charity’s cheer points and hear people encouraging me on.